Mary Reibey is one of the most famous early convict women in the colony of New South Wales. A convicted horsethief, Mary went on to run an extensive importing and mercantile business and there are numerous references to her business dealings, liquor licences, land grants and purchases throughout the State archives. Although Mary was a very successful business woman she took time out for more philanthropic pursuits. For example, in 1825 she became one of the governors of the Free Grammar School. What follows is a small selection of documents, chosen because they reflect some common themes in Mary's life. 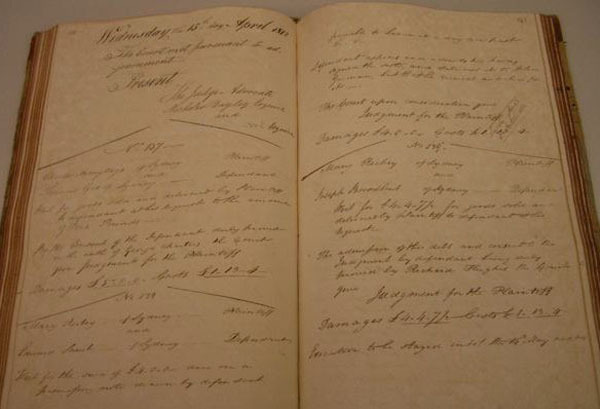 Included are some easily accessible records such as probate and land grants and also some more unusual records reflecting Mary's acute business acumen. Below is a list of records that have been consulted in the creation of this webpage. 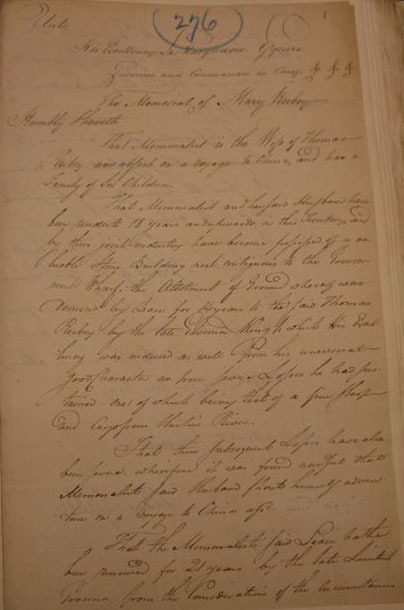 This page is from the Musters and papers per Royal Admiral, which arrived in Sydney on 7 Ocotber 1792. This close up of the entry for Mary Reibey, nee Haydock, reads Mary Haddock, alias James Burrows, trial at the Stafford Assizes on 24 August 1791 and sentenced to seven years. When Mary was arrested for horse stealing she was dressed as a boy, hence the alias James Burrows. This is the only convict listing for Mary that could be located. 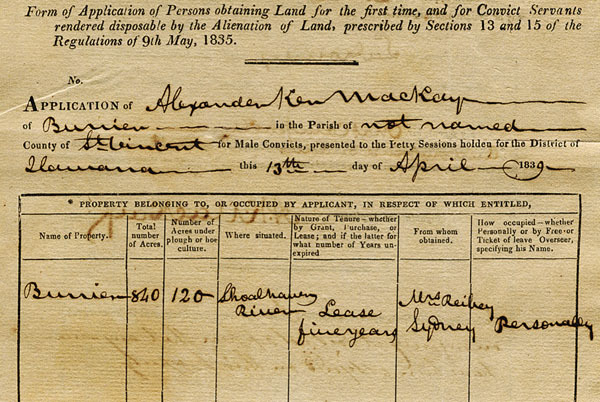 The other typical convict records, such as a ticket of leave, pardon, assignment or permission to marry, appear not to have survived. This is common for the convicts who arrived in NSW before the 1830s. From NRS 1155 [2/8276, p134]. This is the first page of two of a memorial dated 25 January 1810. It is the first of many letters from Mary to the Colonial Secretary to have survived. Mary's husband Thomas ran an importing business called Entally House. In this memorial Thomas is overseas in China and it is Mary that appears to be running the Sydney end of the business. Mary is asking for confirmation of a lease of a store building and land beside the Government Wharf (near present day Customs House). When Thomas and his business partner Edward Wills both died in 1811 Mary took over control of all the business interests. She appears in the Colonial Secretary's papers many times pursuing liquor licenses, business opportunities and land. Although Mary had land and farms in various locations around Sydney she lived in Macquarie Place and operated her business from there. From NRS 897 [4/1822, no. 276]. 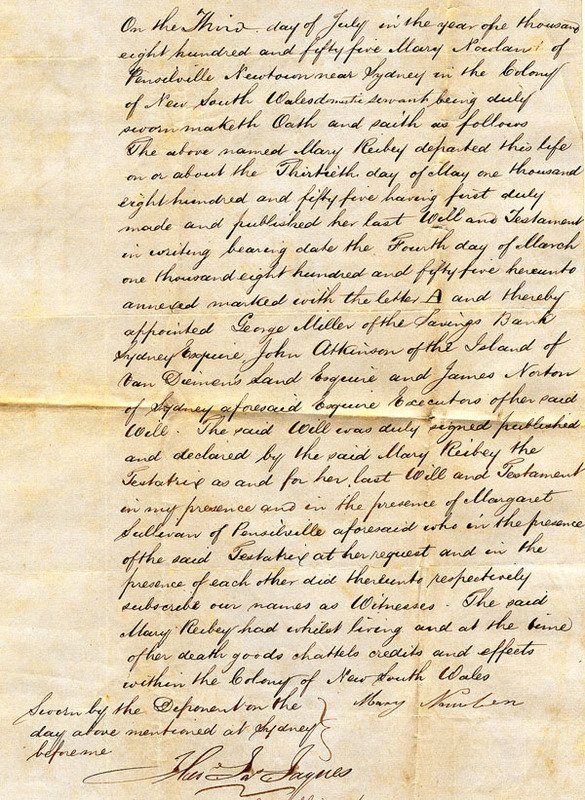 This document is an application by Mary Reibey to the Colonial Secretary for permission to bid for land with a view to eventual purchase. Mary Reibey owned many portions of land throughout Sydney and NSW. There were several farms along the Hawkesbury (including two farms in Wilberforce that appear in a sketch accompanying the rest of these papers), and land at Sutton Forest. In Sydney, Mary owned land land at Hunters Hill and in the centre of the city, George St, Macquarie Place and Castlereagh St. 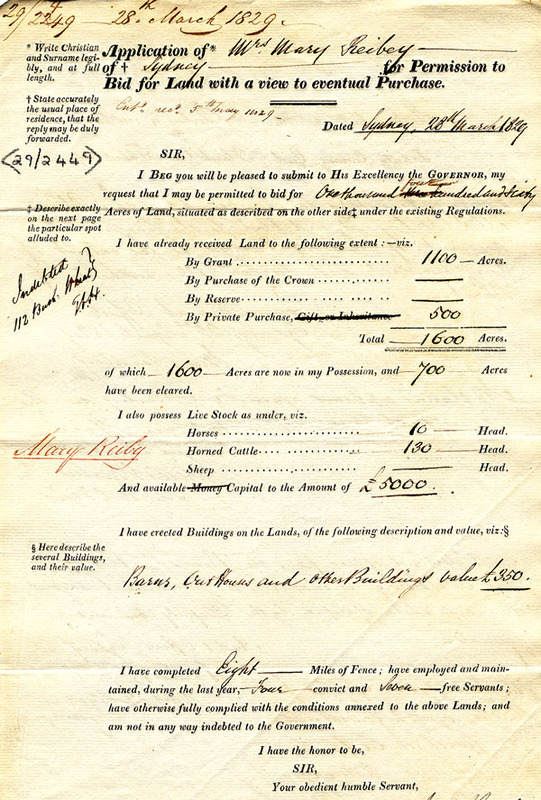 This application, dated 28 March 1829, is for permission to bid for 1460 acres of land to add to a grant of 1100 acres, and a further 500 acres purchased privately. On the reverse of the application is a description of the land, known as Illaroo, which is bounded by the Shoalhaven River. Mary had eleven people employed on the property to look after the stock and buildings. From NRS 907 [2/7956]. 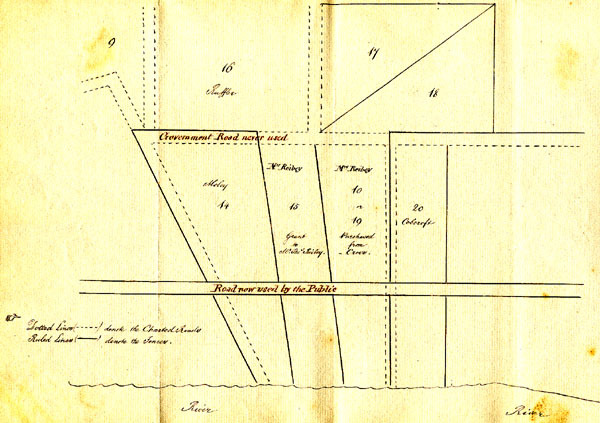 This sketch of a farm at Wilberforce owned by Mary, was enclosed with a letter to the Colonial Secretary asking for permission to fence in an unusable section of land. The letter details that the section of land shown in the sketch as 'Government Road never used' was subject to flooding and the public now used another road. You can see from the sketch that Mary's neighbours had already enclosed the old road on their properties. From NRS 907 [2/7956]. 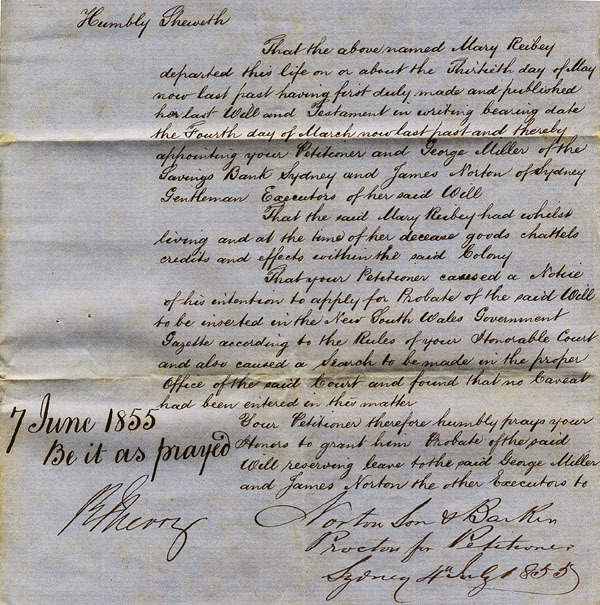 This is an application made to the Colonial Secretary by Alexander Mackey for convict labour to be assigned to him to help on his leased property of Burrien on the Shoalhaven River. 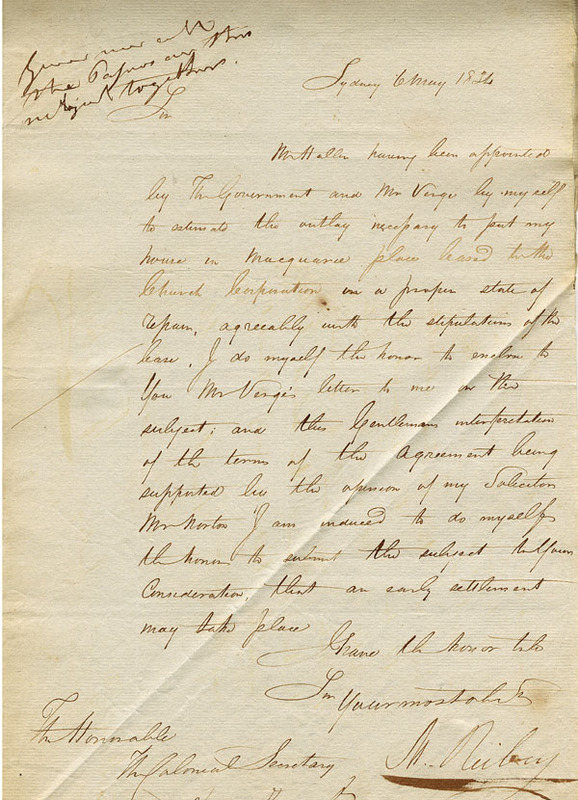 The farm was owned by Mary Reibey and in letters accompanying this application she objects to Mr Mackay's request on the grounds that he is not leasing the land, but merely superintending the land. As such he has no authority to apply for convict labour to be assigned to him. The application was subsequently refused. From NRS 905 [4/2457.5 letter 39/10030]. This volume is one of the Minutes of Proceedings from the Court of Civil Jurisdiction. The Court mostly dealt with judgements on legal and equity matters, such as promissory notes and recovery of small debts. There are a number of entries relating to Mary Reibey, mostly as a plaintiff. She appears to have used the Court to pursue those in debt to her and the Court usually found in her favour. This volume is open to 15 April 1812. 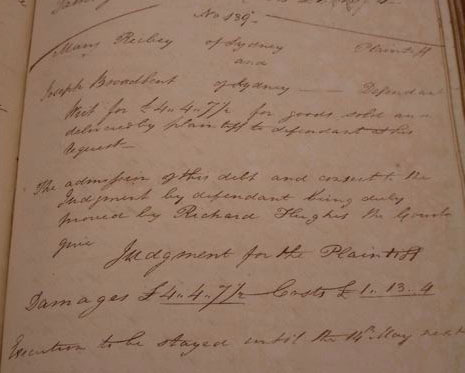 In Case 138 (at the bottom of the left hand side page) Edward Lamb is the defendant while in Case 139 (on right hand side of page) Joseph Broadbent is the defendant. For more details on Case 139 see next image. From NRS 2659 [5/1107]. In Case 139 Mary is suing Joseph Broadbent for the non payment of goods to the value of over four pounds. Mary was awarded damages and costs. From NRS 2659 [5/1107].